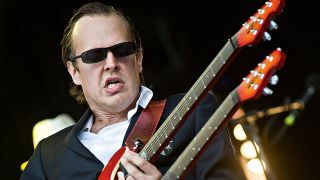 Starting on guitar at the tender age of four, Joe Bonamassa had a head start on many of his peers, compounded by the fact that he was taught by the great Danny Gatton at just 11. Musically, Joe’s first love is British blues in the mould of Eric Clapton and Jeff Beck - also absorbing the styles of Jimmy Page and Paul Kossoff. The rockier, riff-based sound of the latter two players has been a major influence on Joe’s songwriting and is represented in a couple of the examples here. Though honoured with a bewildering range of signature guitars and the owner of what must surely be one of the most comprehensive collections of vintage guitars and amps out there, Joe’s rig is pretty simple. All you’ll need is a distorted tone (via pedals, or a cranked amp is fine) and a humbucker-equipped guitar to reflect Joe’s affinity for vintage Gibson Les Pauls. That said, Joe doesn’t play Gibsons exclusively - you’ll see him with Strats and Teles too on occasion. If you’re using a Fender-style guitar with single-coil pickups, you can fatten their tone with a little extra bass and midrange. Some added gain can help with lower powered pickups too. A touch of reverb will also sound great. Using a neck humbucker and a fairly high gain overdrive tone, this example introduces some nice touches. Starting before beat 1 of the first bar acts as a ‘pick-up’ into the long sustained note that follows. There’s no vibrato here - and this makes correct pitching very important. Joe’s tidy technique allows him to play lines like this cleanly. Rhythmically similar to the previous phrase, this line takes a highly melodic direction, tracing a few of the notes that make the C minor chord underneath. Repeating rhythms this way is a great improvising trick and is by no means Bonamassa’s own idea - most blues guitarists take this approach at times. Shifting to a more urgent-sounding high register, this lick brings in a few 16th notes, the speed hinting more at Joe’s rock influences. This is further enhanced by using the bridge pickup. These high-register string bends can be tiring for the fingers so make sure to brace two or three fingers together for extra strength and control. Shifting gear to a rockier, riff-based style, this example begins with some growling, low register vibrato, moving on to some quicker pentatonic phrasing. Repeated ideas like this figure highly in Joe’s faster playing and it’s not always as taxing as it may first seem! Dig in hard with the pick to create an aggressive feel. At first listen, this example may seem complex, but as you break it down, you’ll see it stays within quite a small area of the fretboard, with lots of repeated ideas. That isn’t to say it’s easy, but giving your fretting hand fingers a repeating routine will help you produce impressive results within quite a short time.